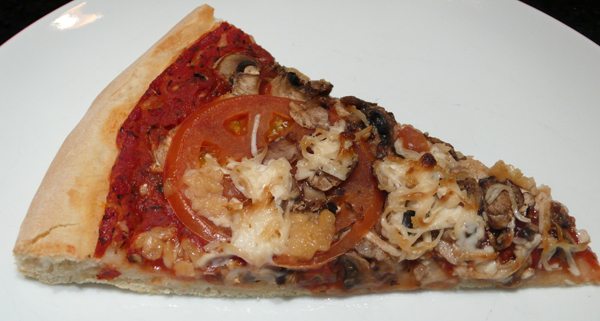 Back in the late 90s when I lived in Seattle, there was a craze sweeping called “take and bake pizza”. 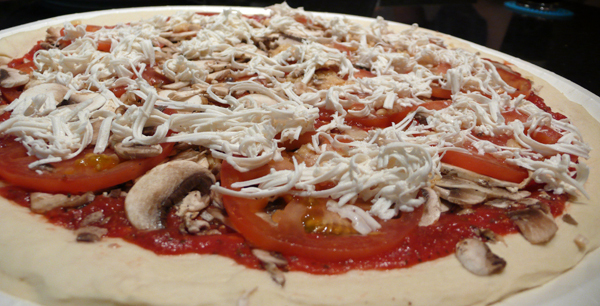 The basic premise is that the pizza joint will make you a super dooper pizza with the crust, sauce, cheese and toppings you desire and hand it to you uncooked. 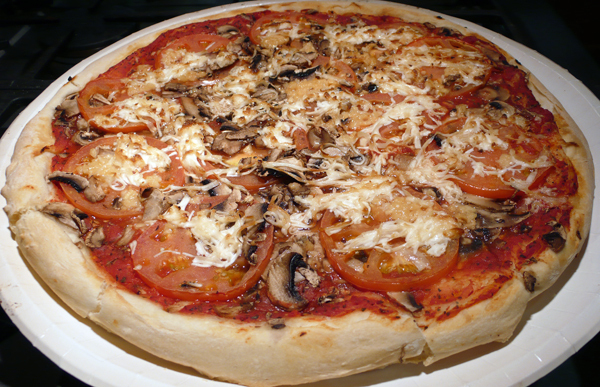 You take it home, and when you’re ready for it, pop it in the oven and get piping hot, fresh pizza within a few minutes. The best known take and bake chain is Papa Murphy’s, which sadly has no Southern California outlets. It’s no secret (bear with me here) that I’ve been spending a lot of time lately at Father’s Office, a snobby bar in Santa Monica with a great beer selection. Sadly, their insane “no substitution or alteration” menu policy leaves us vegans with no food option other than very, very greasy fries. 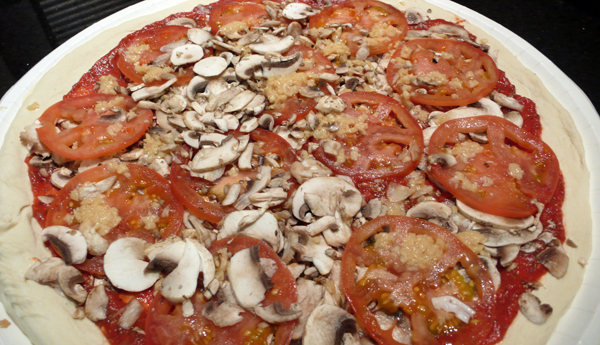 Fear not, as an amazing vegan pizza concoction can be pieced together by walking a few blocks around said establishment on Montana Avenue to gather up the ingredients before heading home to cook them. First, visit the Montana Whole Foods Market. This used to be a very swanky Wild Oats until Whole Foods bought the chain and converted it a year or so ago. Pick up the requisite Follow Your Heart vegan mozzarella cheese and maybe a nice bottle of wine from the over-priced and limited selection that is a trademark of Whole Foods wine departments everywhere. Be careful not to trip over the guilty-liberal-starbucks-sipping-leggings-wearing-yoga-mat-toting Santa Monica residents on your way out. Then, trot a few blocks down south on Montana to Patty’s Pizza which is, as far as I know, LA’s only take and bake pizza place (there’s a Nick ‘n’ Willy’s take and bake outlet in Valencia, which I have to try sometime unless SCVegan beats me to it). Basically, you can order any vegetarian pizza you want but ask for NO cheese (you have all the cheese you need in your Whole Foods paper bag, don’t forget). 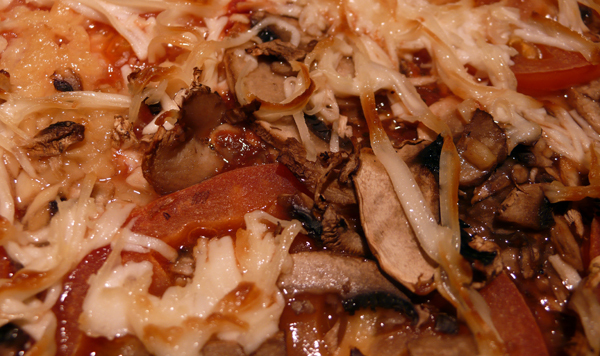 As the pizza isn’t being cooked, it’ll usually be ready in about five minutes after you order it. So, head home with your cheese, uncooked pizza and a bottle of wine (entirely optional, but highly recommended!). I don’t know about Patty’s pizza, but in my (somewhat extensive) experience of purchasing Papa Murphy’s pizzas to take home and bake, you can leave the pizza uncooked in its plastic wrap in a fridge for a day or two and it still cooks up just fine. Preparing the pizza is a snap. All you have to do is grate a small amount of Follow Your Heart cheese and carefully apply it to said dish. For this 18-incher we used around a third of a slab. As we’re using the dubiously meltable Follow Your Heart, make sure you grate the cheese finely (using the smallest grating holes on your greater), and press the cheese lightly down into the sauce as it melts better that way. Also, be careful when you’re grating the cheese as these slabs are a little slimy (like picking up a toad), and you won’t want it to slip out of your hands and slap down in the middle of your pie! Once you’ve topped out the pizza, simply follow the directions on the label to the letter and in about 10 minutes you will have a very, very good pizza that’s probably better than anything you can create at home. Oh, I checked with the lady in the store, and she confirmed that the dough and sauce are vegan, and that the optional soy cheese does contain casein, so you have no real option but to cheese it yourself. So, what’s the catch? 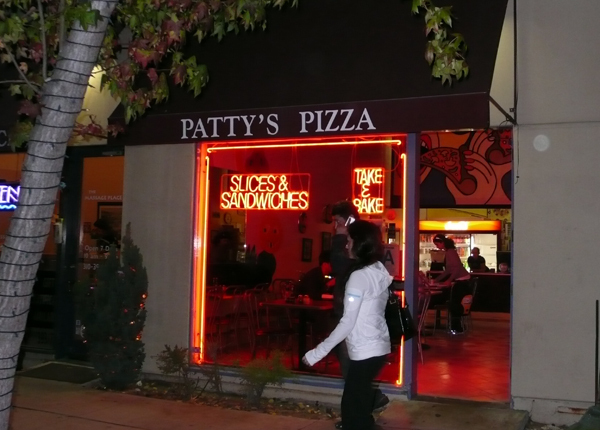 Well, I have two pet peeves about Patty’s pizza. The first is that they don’t discount any money for asking for no cheese — why can’t it at least be priced as an optional topping? The cheese must be the most expensive ingredient, so they’re saving quite a bit on pizzas ordered without it. In our case $18.75 for the pizza with three toppings. The second peeve is the rude service. Frankly, the people on the cash register there are not very nice. The lady that took my order was rushed (even though we were the only people in line) and when I came back to pick up the pizza after using the restroom it was basically thrown at me with no eye contact by another lady. Bottom line: Don’t go to Patty’s for a low-budget dinner, or to feel appreciated but do go there for a really easy to prepare vegan pizza that tastes absolutely delicious.